Jamparc is a new plug-in for Rhino 4.0 SR9 developed by Jam Parc, an associate manager at Heerim Architects & Planners in Seoul, Korea. 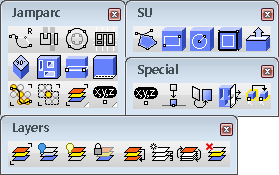 Jamparc includes special commands for SketchUp, layer management, and architectural tools. You can download it for free at his blog.